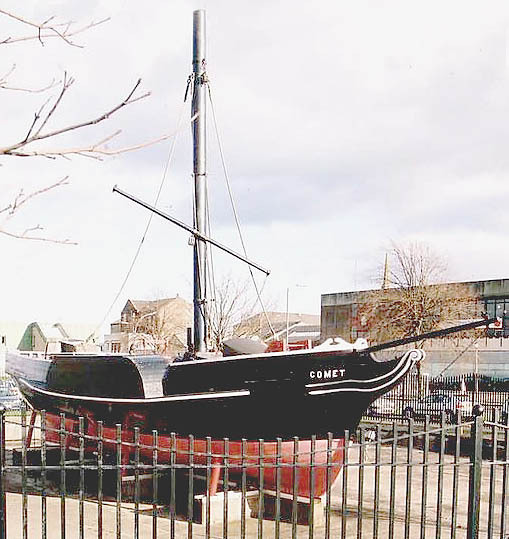 A major exhibit traced the career of the first Provost, Henry Bell, and the part that he played in this development, starting with the setting up of the first efficient steam navigation service to sail the waters of Europe with his famous "Comet". A large part of the exhibition area was taken up by a brilliant model of Craigendoran station in the days when the trains came right up to the pier and four boats could berth at the same time. This exhibit was the work of the Helensburgh Modellers Club and the Helensburgh Model Railway Club and was manned and operated by members throughout the exhibition. Sadly, it had to be dismantled in 2003 when the building that housed it was in was given up by the Council and all the organisations had to find other accommodation. However it has been set up again and is housed in the Library in West King Street. In the mid-eighteenth century there was nothing but a small collection of fishermen's cottages where Helensburgh now stands and the religious and educational centre was Row Parish (now Rhu). In 1700 the land, known as Milligs, was bought by Sir. John Shaw of Greenock who in tended to build a settlement but this did not take place. The land was bought later by Sir. James Colquhoun who advertised it to be feued in 1776, offering special encouragement to "bonnet makers, stocking, linen and woollen weavers". The new village would be "regularly laid out for houses and gardens to be built according to a plan". There was little response and by 1794 only seventeen houses had been built on the lands which were re-named Helensburgh in honour of Sir James's wife, Lady Helen Sutherland. Although still small, Helensburgh was created a Royal Burgh of Barony on 28th July 1802. The first Provost was one Henry Bell, Proprietor of the Baths Hotel (now Queen's Court). He was elected in 1807 and served as Provost until 1811. In the same year this enterprising gentleman commissioned a steam vessel which he named "The Comet" after "The Great Comet" which had been seen in the skies in 1811. In August 1812 she made her first commercial voyage down the Clyde, earning the title of "The first efficient steam vessel to sail European waters". At first the public were suspicious of this novel form of transport but by 1814 others had taken up the challenge and by the mid-1830's there were "more than three dozen steamships" on the Clyde. In 1812 there were only 200 houses in Helensburgh but now the town began to grow although, surprisingly, it was not until 1836 that the council decided to take over "the property of the Quay" with a view to constructing a proper and long overdue pier. It took a further 9 years and a public meeting to translate this into practical moves to seek Parliament's approval of an extension to the quay and other improvements. From 1812 onwards the Helensburgh area developed and increased in popularity as a watering place. At first, people came from Glasgow by "public coach, carrier's cart or wagon" but after 1812 many sailed down from the Broomielaw. It was not only the town that developed. Glasgow families discovered the beauty of Garelochside and the shores of the Rosneath peninsula and began to build fine houses along the shores where the family lived all summer and the breadwinner could commute to Helensburgh or Greenock by boat, completing his journey by train. Piers were built connecting every part of the Peninsula. Sadly, only two remain in use — Helensburgh and Kilcreggan. The Glasgow, Dumbarton and Helensburgh Railway (later L.N.E.R.) was opened in 1857. In 1877 the railway company had the vision of "a station in the sea" in Helensburgh but this was fiercely opposed by a number of people, notably the influential Mr. William Kidston who gave his name to Kidston Park. It was thought that such a station would "arrest the progress and destroy the prosperity of the town . . . from a flourishing and favourite watering place to a dirty, coaling town". The scheme was frustrated and the new pier and station were sited in Craigendoran, opening in 1882 with a fine station and pier. which served the people well for 90 years. The Town of Helensburgh grew in size, and as it grew, churches were built, one of which was the West Parish Church, later St. Bride's but now demolished. The first minister was the Rev John Baird, B.D. and the Bairds had a son, John Logie Baird, who was to become world famous as the inventor of television. As time went on, more people were attracted to this beautiful part of Scotland where they could enjoy their hobby of sailing and yet travel to Glasgow for business. One such person was Mr Blackie, the publisher, who commissioned Charles Rennie Mackintosh to design Hill House, the architectural masterpiece which is visited by thousands of people every year. The combination of travel on the water and the short distance from Glasgow made Helensburgh one of the favourite holiday resorts in Scotland during the first 30 - 40 years of this century. In those days the beach was sandy and the children played with bucket and spade. The Glasgow people still come but usually go home at night. Sailing is still a favourite recreation and the Waverley calls regularly at Helensburgh pier. The Comet is represented by a model and Henry Bell is commemorated by a street and an obelisk.